The Ultra 180 is ideal for a desk-mounted computer. It has a slim profile that frees up your desktop to increase workspace. You can easily lift and lower your computer and adjust it for best ergonomic comfort, improving productivity and easing eye and neck strain. The monitor has full tilt, pan and rotation capability. Shown with a 5″ desk mount riser, a poly keyboard tray, and an 11″ extension arm, the Ultra 180 offers premium features in a sleek design. The Ultra arm is protected by U.S. Patent 9,243,743. *Available in your choice of 14 colors. The Ultra arm is fully counter-balanced for effortless movement. 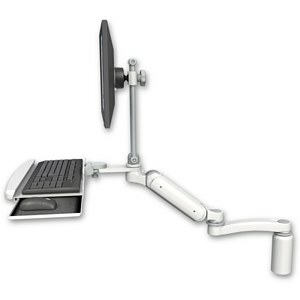 This desk-mounted arm provides up to 180 degrees of vertical arm rotation and up to 360 degrees of horizontal rotation. The Ultra 180 has a small footprint and stows compactly. Cable channeling through the arm assembly creates a neater appearance, protects wires and simplifies cleaning. Engineered for years of reliable service and quiet operation, The Ultra 180 arm is machined out of aircraft quality aluminum and is powder coated with an attractive, durable finish. Hand assembly ensures that a quality product is shipped to you.